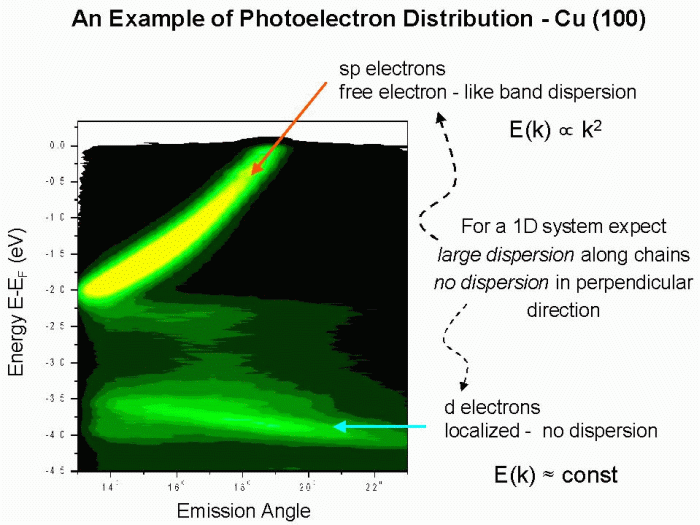 Photoemission (also known as Photoelectron Spectroscopy or PES) is a spectroscopy technique used for measuring the electronic structure of solid materials. Photoemission is especially useful for studies of ordered (crystalline) materials, such as elemental metals and semiconductors, but is also used for inorganic and organic compounds. The principle of PES is illustrated on a diagram below. A photon beam from a well-characterized source (arc lamp, laser, or synchrotron radiation) is directed at the sample surface. These photons, depending on their energy, can excite electrons in the solid and some of these excited electrons will escape from the solid. Analyzing the energy and direction (momentum) of the emitted photoelectrons one can gather information about the electronic states of the studied material. Two very important components for PES are the light source and the electron analyzer. Arc lamps and lasers are used as light sources in the laboratories, but for materials studies Synchrotron Radiation (SR) is a more convenient light source, because SR includes very intense beams of polarized photons in the suitable energy range (10–1000 eV). On the electron analyzer side there has been a lot of progress recently with developing detectors capable of simultaneously analyzing the energy and angular distribution of electrons emitted within 10–15° angular range. 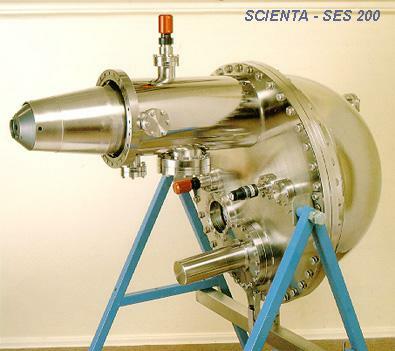 An example of such an analyzer from the Scienta series is shown above. Data from such parallel-acquisition analyzers can be plotted as E(k) energy band diagrams, as shown in the example for copper below. Copper is a metal and, as expected, it exhibits a strong parabolic band that crosses the Fermi level. Examples of PES use for studying low-dimensional structures on Ca-Si(111)3×1 and Au-Si(111)5×2 surfaces.